As far as I know, musicians who form wind quintets have other ‘jobs’, as the breadth and appeal of music literature for the combination of flute, oboe, clarinet, bassoon and French horn would not sustain a grand living, I suspect, regardless of one’s talent. This thought crossed my mind as I played this disc and studied its packaging, both audio and visual cues suggesting a rather empty-hall existence. 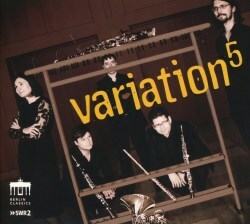 As it’s also the CD debut of Variation5 (V5), their collectively written liner notes, together with the somewhat superfluous, blow-by-blow diary of their recording experience, give the whole enterprise a self-help feel. Such may be the brave new world of classical music in the social media age. That said, I don’t mean to detract from the quality of performance and programming of this CD, which is excellent. V5 have selected four wind quintet gems from the first half of the twentieth century (there would possibly have been room for a fifth, ideally from further East or the Americas) which nicely complement each other in style and expression. Beginning with Malcolm Arnold’s perky take on well-known sea shanties, V5 display a vivacious rapport which keeps these ditties sailing happily along. They have the full measure of Arnold’s audacious harmonies and rhythms, making them sound entirely natural. In the calmer waters of “Boney was a warrior”, the drunken sailor is still a bit tipsy, but endearingly and syncopatedly so. To finish, “Johnny come down to Hilo” is then bursting with good humour and boisterousness, as it should be, V5 above all conveying the music’s great sense of fun. From the perky to the quirky, and the wonderful imagination of Jean Françaix. The liner notes exclaim how “outrageously difficult” his first quintet is to play, and the challenge of normalising its “sprightly vitality”. V5 succeed brilliantly, bringing out all the work’s twists and turns, zany exuberance and chaotic mischief, leavened by saner passages of intriguing harmonies and moods, quixotic one moment, insouciant the next. Shades of Ibert’s Divertissement, perhaps, but even more unhinged. The work culminates with the most glorious raspberry on the French horn, the suggestion of an ill wind driving its companions to a subdued and submissive final cadence. If sanity appears to return with Paul Hindemith’s Kleine Kammermusik, the music-making remains just as intense. Here is another ample demonstration of why the widely held view of Hindemith as drily academic is wrong. This is a delightful quintet, its moments of faux pomposity promptly undermined by playful, harmonically daring rejoinders. If a cardinal measure of ‘greatness’ is memorability, then this work has it in spades, not least the bracing finale, marked Sehr lebhaft. Some 40 years ago I recorded it live, and that dah-dah-dah-de-de-de-dah-de-de-de-dah motif has been popping happily into my head ever since. V5 do the work full justice, suitably unbridled in spirit but also highly disciplined, rhythmically alert, and superbly balanced. Balance is also key to Carl Nielsen’s Quintett, a quintessential work of this genre. V5 clearly grasp the wealth of colour Nielsen explores in this composition, each instrument given equal weight in the sonic palette. With playing that is beautifully cultured and full of felicitous touches, V5 reveal the poetry of Nielsen’s writing, its pacing and dynamics, no more so than in the final theme and variations, guiding the work with immaculate intonation and ensemble to its dignified conclusion. Earlier I referred to the recorded sound, which I would liken to eavesdropping on a rehearsal. Everything is present and correct, but with rather a sense of detachment – a bit chilly, even. My model for small wind group recording is that afforded by Philips in the 1960s and ‘70s to the Netherlands Wind Ensemble – intimate, but warm and expansive. While not claiming this to be the universal ideal, I do wonder if contemporary sound engineers ever listen back over recording history to set their compass. The playing of Variation5 is so good here, even better sound might have tempted me to give this release the highest accolade.